I am watching a lot of television lately. A lot. Even I, a truly prodigious reader, find it hard to read every minute of the time I’m hooked up to my continuous passive motion machine. When I finally tire of reading, I have limited mobility, especially by nightfall, when my balance on crutches seems to take a dive off the cliff. This means that, when the rest of the family wants to watch TV in the evening, I’m something of a captive audience. I’m not complaining. 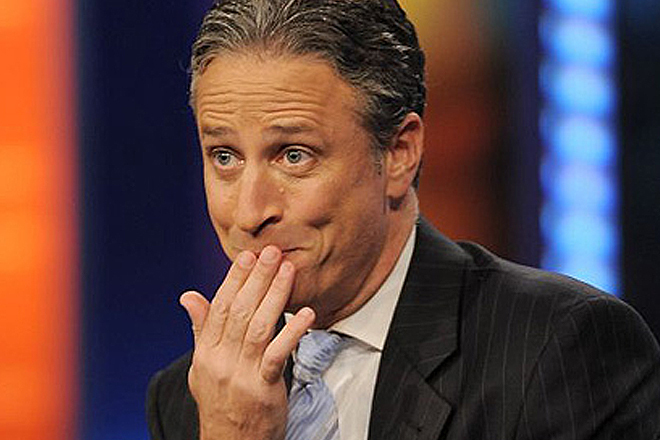 Instead, I’m explaining why it is that I’ve been watching Jon Stewart’s Daily Show these past few days. Usually I leave the room when he starts, because I find his mixture of genuine and faux stupidity irritating. It’s not a witty show, which I would be able to watch even though I disagree with the politics. It’s a witless show, and dishonest to boot. Few things highlight these abysmal qualities more than a segment Jon Stewart did about Boehner’s announcement that Republicans would not go forward with any immigration reform because they couldn’t trust Obama to enforce it. For anyone paying attention to the Constitution and the facts on the ground Republican fears are reasonable. Obama, despite his job description as chief executive officer, tasked with enforcing the laws that Congress passes, has a history of refusing to enforce laws he doesn’t like, especially when it comes to immigration. More recently, with Obamacare, despite the Lefts’ strident screams in October that Obamacare is the “law of the land” and cannot ever be touched — even by the Congress that passed it — Obama has changed the law almost 30 times. Indeed, he’s changed the law so often, he’s even riled his supporters. Boehner may also find it a little difficult to trust Obama since Obama lied knowingly, intentionally, and repeatedly in connection with Obamacare’s passage and implementation. It was the biggest fraud ever committed by a government official against the American people. So how does Stewart defend Obama’s lawless actions? He doesn’t bother to defend Obama. Instead, he attacks Republicans as hypocrites because they have also tried to change the law. In other words, how dare Republicans complain about Obama’s changes to Obamacare when they also wanted to change it? Is it really possible that Stewart is so stupid that he believes that Congress should not change, or attempt to change, a law if the president is not allowed to do so himself? I find it hard to believe that Stewart is quite that dumb. And if he’s smart, he and his team are writing shticks deliberately intended to mislead an audience that Stewart presumably knows is dumb enough not to understand that, while the president is constitutionally barred from unilaterally changing or refusing to enforce laws, Congress’s sole function is to pass, edit, and revoke laws.